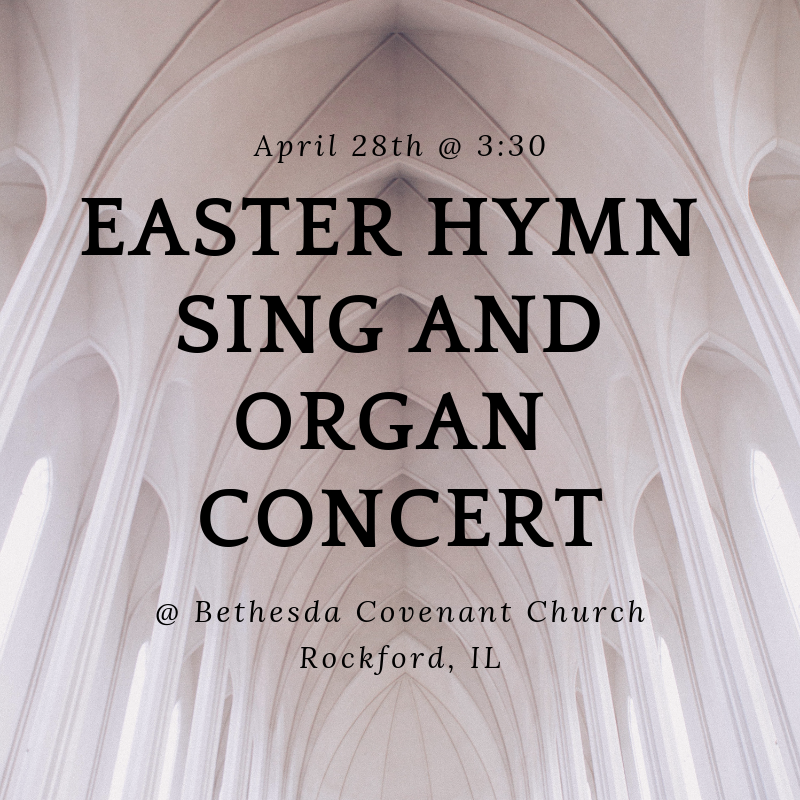 Bethesda Covenant Church in Rockford will be hosting a community wide Easter Hymn Sing & Organ Concert on Sunday, April 28th @ 3:30 pm at Bethesda. Dr. Tony Payne (organist) professor from Wheaton College. He has composed over 100 songs & hymns for Christian worship, pop and folk, a chamber opera on The Little Match Girl, concertos for concert band & orchestra, numerous choral & vocal pieces…most recently The Last Words of Dietrich Bonhoeffer. Dawn Holt Lauber (soloist) who is a member of Glen Ellyn Covenant Church. Dawn is an accomplished vocalist who has sung with the Chicago Jazz Ensemble in Russo’s Chicago Suite 2 and Duke Ellington’s Sacred Concerts, among other works. In 2018, Ms. Lauber appeared on the big screen playing the role of Carol Davis in The Rocket. If you have any questions, please feel free to contact the Bethesda Covenant Church at 1-815-397-4212.